I've also added all the known .z3 versions of Zork 1 in the updated chd. You can read more about these versions here. ZORKI.88 is the last .z3 version. There was a 'Solid Gold Edition (.z5), but the infocom CFFA1 only supports z3. Hopefully this is my last upload (cross fingers). If anyone notices a mistake please leave a message. Feel free to leave any message about my uploads.Good bad or whatever. Off topic, THIS YouTube video shows a tutorial on how to install a Generic Bezel for MAME. How flattering because I made that plastic bezel. No that isn't me in the video. Last edited by Anon01; 11/04/18 12:04 AM. Reason: Showing a bezel I made. 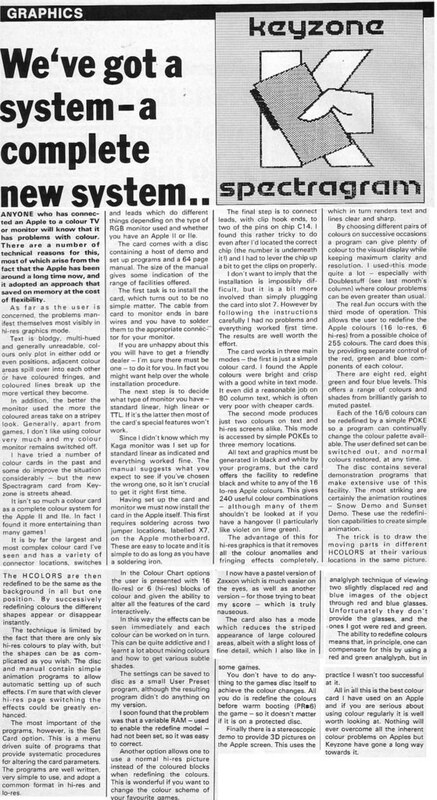 Have you Apple II guys heard about the VidHD from the apple II wizard John Brooks? It outputs 1080p video and has some interesting text mode abilities like HD text modes: 40x24, 80x24, 80x45, 120x67, 240x135. Yes, the mirroring was only to easily demo at kfest the equivalent number of 80x24 text pages usable in each extended text mode. 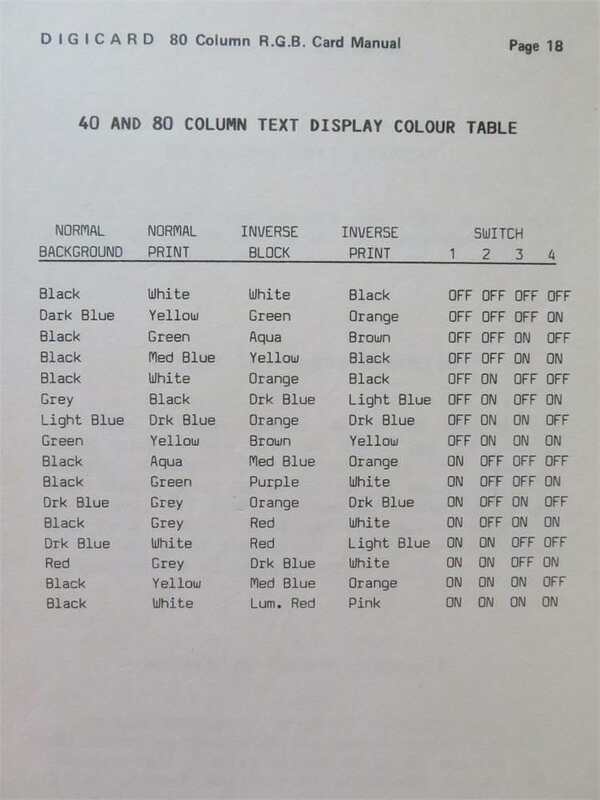 The normal mode stores text in aux mem at $2000-$9E90 (240x135 chars). control panel. How is that accessed? The VidHD control panel is currently activated by pressing Ctrl-^ (Ctrl-6) in any app. VidHD watches the CPU bus for a read of Ctrl-^ from $C000. When this happens, VidHD pauses the CPU, takes over the bus, reads the keyboard, and runs the control panel UI. 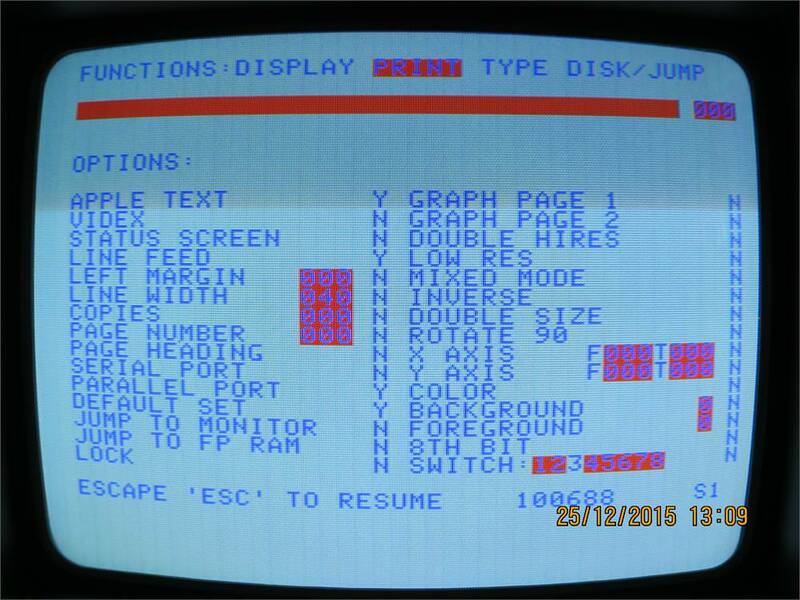 From the control panel screen, when the user presses return (to accept changes), or esc (to cancel), VidHD restores the active AppleII video display and the AppleII CPU is released to continue running. You enable double-lores, but then disable 80 column mode. IE, lores graphics mode with AN3 on. It's cool because it's partial hires in only 1KB. And yes, VidHD includes this crazy 280x48 mode and 4-color hires too. I should figure you guys know about the VidHd. Especially considering the text on the "Bitsy Bye" screen. That's the coolest thing I've seen for a long time. 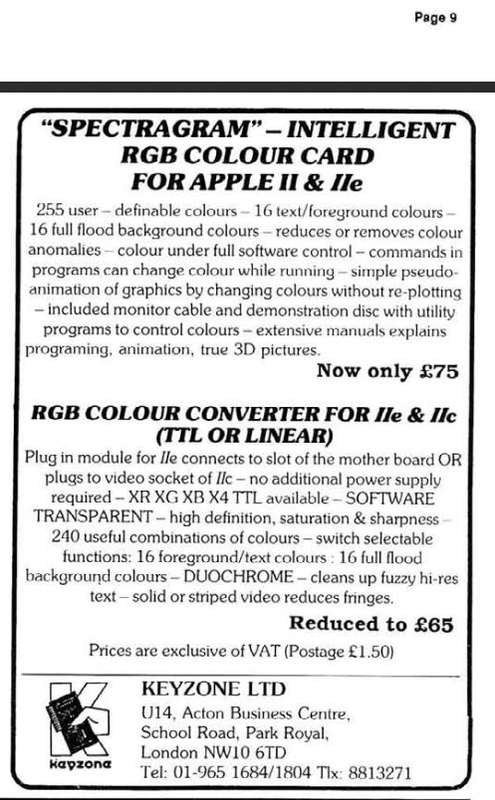 Reading up on the discussion around it, other Apple video boards were mentioned which got me searching on Apple II RGB cards. 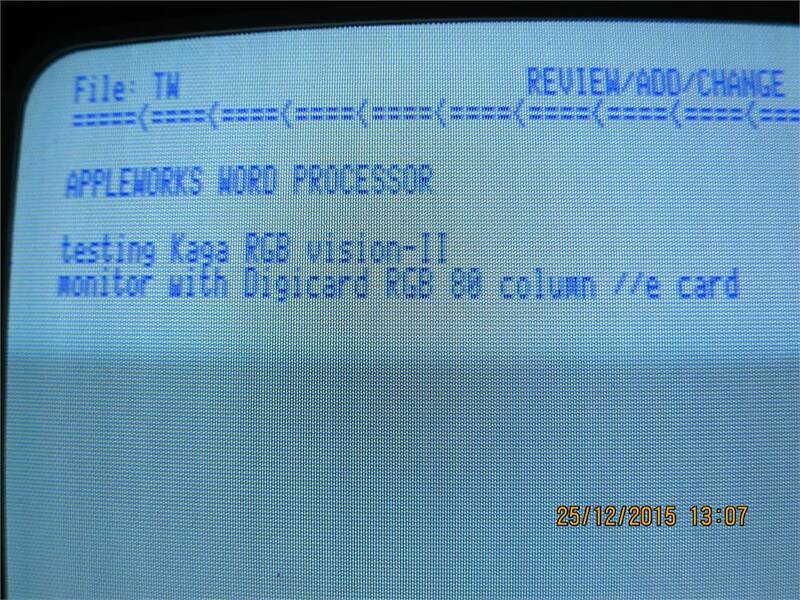 I found some interesting pictures and video of a DigiCard IIe RGB board with a blue text screen that looked really interesting, where the inverse text color wasn't just inverse bits but different colors. I'm guessing this is the Light Blue/DarkBlue/Orange/DarkBlue combination. It's a "Fingerprint Plus" screen. This was a look I'd never seen before. 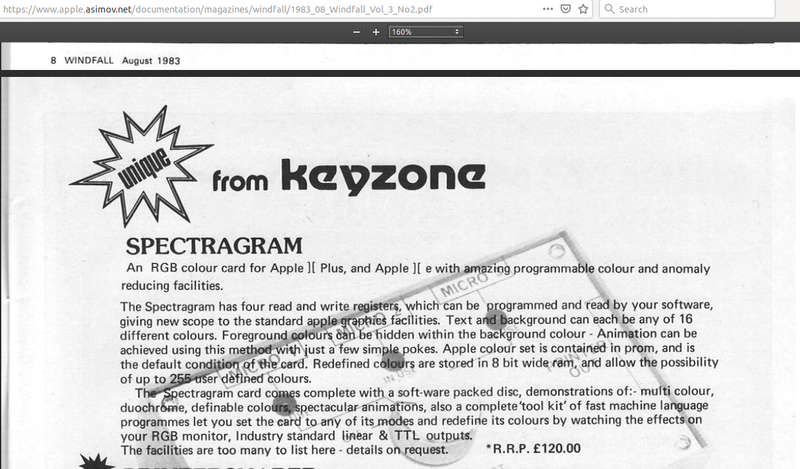 I recently heard about a Apple II video RGB card that I had never heard of before: The Keyzone Spectragram. This is actually pretty cool in that it you can remap the apple hi-res colors into different colors. I notice there has been an update to the Apple /// font uploading, thanks. I also noted the comment that its still not perfect.. I had a look and it seems the wrong address was mistakenly used for turning off char writing, it should be $C0DA, and not $C0DC. I had a quick try and it seems to work ok from what i can see when this is updated. I saw your csa2 post and did that update. Nice catch, changing it to $C0DA does improve Atomic Defense (the in-game status bar font is now correct). Thanks for updating it, the font loading does looks like its working well now. I did a quick bit of investigation with a logic analyser. When the Video display is on, the Apple3 downshifts to 1MHz for each scan line, and then upshifts back to 2MHz for the blanking period. I can see that this impacts the overall effective speed quite a bit. And can also see why they built the function in the console driver to be able to turn off the display when you wanted it to run faster for raw processing power. I did a quick hack to set the clock to 1.5Mhz, and then the speech sounds much more like on the real metal. When set like this though, Atomic defense does not seem to run well with the smooth scroll, so seems its needs this up/down clk speed emulated correctly when the display is on. I suppose the code is relying on 2Mhz clk to get as much done in the blanking time as possible. One other observation is that the ram refresh also causes the downshift to occur, so the A3 never really gets the full 2Mhz speed :-(.